A Thanksgiving holiday-shortened week this week will see reports relating to business investment and minutes from the Federal Reserve Open Market Committee Oct 31-Nov 1 policy meeting. Even though markets are pricing in good outcomes, risk assets can continue to perform well because monetary and fiscal policy remain supportive of growth and data reaffirms our conviction that the economy is on an expansion path. The value of U.S. equities is now over $28 trillion. At 145% of gross domestic product, this would suggest valuations are full. Since 2004, the market value averaged about 120% of output and fell to 60% of GDP in 2009. Another example that shows markets are already anticipating good outcomes is that the S&P 500 trades near 18x expected earnings. The average multiple was closer to 16 times and 14 times over the past five- and ten-year periods, respectively. We think the higher multiples speak to a better near-term growth outlook, but also imply some drag on returns over the long-run. Even though markets are pricing in good outcomes, risk assets can still perform well as monetary and fiscal policy remain supportive. Short-term interest rates are still low compared to inflation, for example. After deducting inflation, short-term real interest rates are just over 0%. This is highly accommodative compared to the 1-2% real rates seen throughout the 2002-2007 cycle, and the 3-5% real rates seen during the late 1990s. Today’s low rates encourage a longer credit cycle, improving near-term growth prospects. Further lifting the growth outlook is some expectation for a fiscal push relating to tax reform. While there are plenty of details to work out on this front, the fiscal bias appears favorable to the growth outlook. The most important reason risk assets can continue to perform is because data affirms the economy is on an expansion path. So long as this remains the case, a positive feedback loop exists. We see this behavior extending from investors to business owners and investment. For example, capital goods orders, industrial production, and purchasing managers surveys all suggest positive momentum. Each of these cyclical indicators continue to show good progress following a period of weakness in 2015-2016. Last month’s capital goods orders were up 8% from a year ago — a big improvement from a year ago when the index was contracting at a 5% pace. Since business investment and profits tend to move with capital investment, it provides a useful insight into the cycle. For now, we see that “animal spirits” appear alive and well and this supports our belief that growth continues. A more comprehensive way to look at many of these trends is to combine several different inputs into a single measure. 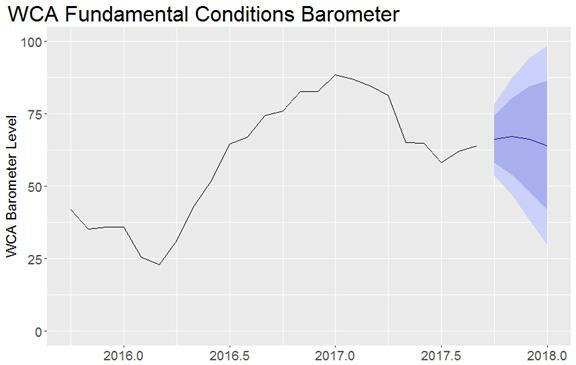 Our WCA Fundamental Conditions Barometer (below) looks to do just this. The barometer looks at a host of market based trends and other economic data to provide an unbiased view of how the cycle is progressing. Readings above 50 generally indicate a more favorable growth environment, whereas readings below 50 can indicate a more challenged outlook. Currently, we forecast the barometer to sit near 60-70 as our base case through year end. This suggests to us that the economy likely remains on the growth track, at least over the short term. So long as markets and the economy remain in this positive feedback loop, risk assets can continue to perform. We continue to look for changes in risk appetite and the economy. Based on shorter-term expectations, the “tactical” allocation within portfolios is overweight stocks versus bonds.